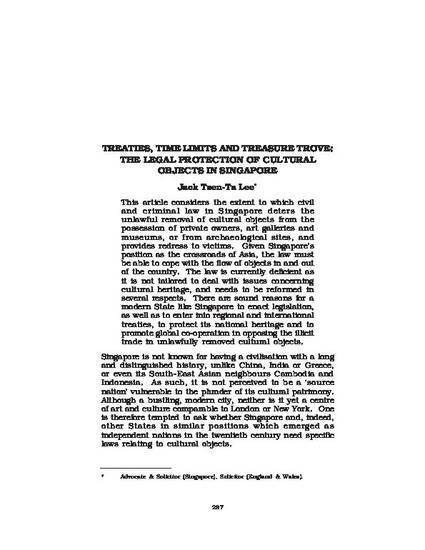 This article considers the extent to which civil and criminal law in Singapore deters the unlawful removal of cultural objects from the possession of private owners, art galleries and museums, or from archaeological sites, and provides redress to victims. Given Singapore's position as the crossroads of Asia, the law must be able to cope with the flow of objects in and out of the country. The law is currently deficient as it is not tailored to deal with issues concerning cultural heritage, and needs to be reformed in several respects. There are sound reasons for a modern State like Singapore to enact legislation, as well as to enter into regional and international treaties, to protect its national heritage and to promote global co-operation in opposing the illicit trade in unlawfully removed cultural objects. © 2004. This article was published as (2004) 9(3) Art, Antiquity and Law 237–280. It may also be obtained from the Singapore Management University repository at http://works.bepress.com/jacklee/5 and the Social Sciences Research Network at http://ssrn.com/abstract=631781.